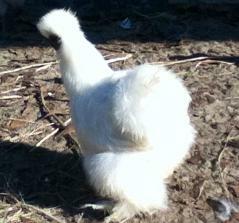 Silkie- A fluffy chicken that make great pets, they are also very broody. They are a very good choice for a show chicken,this is also a great choice for a backyard chicken. Game Chickens- A very hardy breed of chickens, they are a great choice if you are worried about predators. They are very fast, and can fly good compared to other chickens. They are also broody. This an overall great breed. Polish- A very beautiful breed of chickens. They usually have large feathers on their head, unlike most other chickens. A good choice for a show chicken. Speckled Sussex- A very colorful breed, that have red and white specks on it. A good choice for an everyday backyard chicken. Ameraucana- Also called an Easter Egg chicken, an ameraucana chicken is a great chicken. They are one of the few breeds to lay different color eggs. (Blue, Green, Pink etc.) They come in many different colors, and are fluffy around their ears.